We’ve all been there. You look around the house, are completely overwhelmed by the amount of stuff you have, and simply don’t know where to begin. Determined to bring order and organization to your space you decide to tackle the clutter, but soon realize you’ve bitten off more than you can chew. If this is you, you need to check out our 5 top tips to get organized and declutter your life. Perhaps this seems like an insignificant tip to include, but if your decluttering is as daunting a task as mine, you’ll be happy to start with an area that will bring you great joy. Think-- your children’s toy room that is exploding with toys or your bedroom closet that is overflowing with shoes and clothes you haven’t worn in (literally) years. Do you have one of those places? Start there. Straight and to the point- if you haven’t used it in three years, get rid of it. Clothes that are collecting dust in your closet, gardening tools that haven’t seen the light of day in ages, random tchotchkes in your basement, and everything in between- toss or donate. This one is a pretty satisfying one. Grab one bag and fill it with all of the stuff that doesn’t belong in the space that you’re decluttering. Perhaps your bag will be entirely filled with trash, in which case having another bag handy for filling with stuff to donate is a good idea. This is a great way to get a lot of stuff out of the way in a hurry. Seriously, how many coffee mugs do you need? Saying goodbye to multiples is an excellent way to reduce clutter and do some downsizing. Shovels and gardening gloves? You don’t need 5 pairs. And toys? Don’t even get me started on toys. Spend some time looking for multiples and give them a new home. Last but not least, the four-box method is a gamechanger. Trash, give away, keep, or relocate. Given that keep and relocate are sort of the same, you can opt to combine the two, but I’ve found that keep is perfect for stuff that is going to remain the space, while relocate is for stuff you’re keeping but needs to be relocated to a different area. Either way, you get the idea. There you have it. Five easy tips to help you tackle spring cleaning and bring some order to your life. Our hope is that at least a couple of these resonated with you, but keep in mind that there are many more tips out there if these don’t quite do the trick. And finally, the next time you feel the urge to buy something new or new-to-you, ask yourself whether you need it. 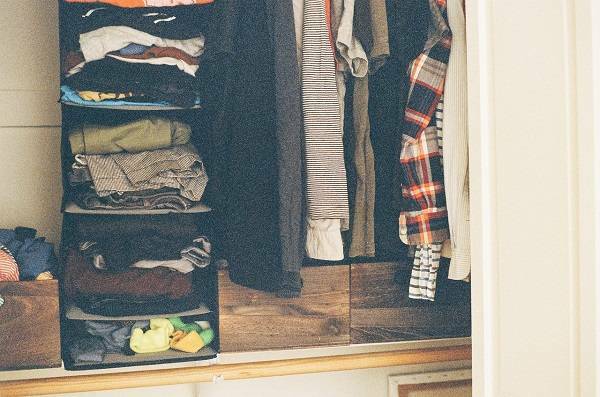 This one simple question may spare you from a future decluttering nightmare.